MAROC 1 Battalion in Brigade support in CALONNE II sector. CAPT. 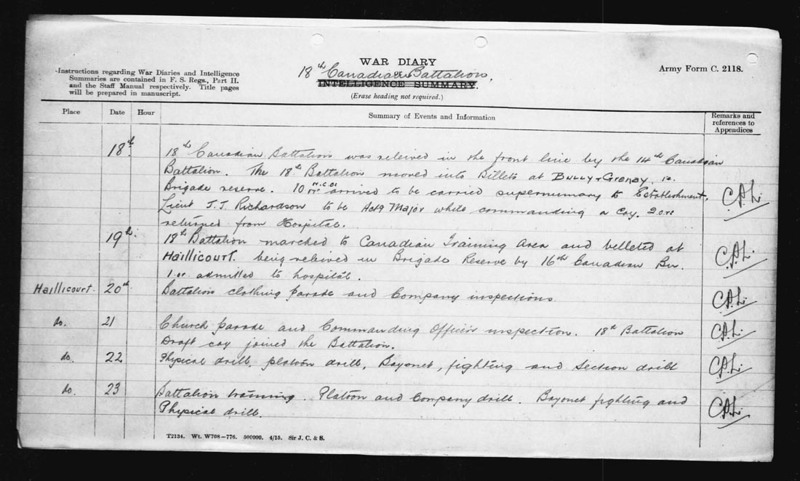 R.H. McCRIMMON returned to duty with Battalion from Command duty. 5 o.r.s wounded while on working part. 2 o.r.s sick admitted to hospital. 2 Positions as shown yesterday. LIEUTS G.R. PARKE, R.S. MORTON, D.C. WRIGHT arrived as reinforcements. 2 o.r.s sick admitted to hospital. 3 18th Canadian Bn. will relieve 20th Canadian Bn. in MAROC sector front line. B coy Right front. D coy left front. A coy right support. C coy left support. Nothing unusual to report. LIEUT. COL. G.F. MORRISON and LIEUT COL H.L. MILLIGAN awarded D.S.O. for meritorious service in the field. 4 Position as shown yesterday. LIEUT. H.N. BAWDEN and 2 o.r. admitted to hospital. Our artillery did considerable damage to enemy wire. Sniper Godfrey[i] shot Hun at M10C7.9. Hun was seen to be carried away with bandage around his head. 5 Position as yesterday. LIEUT. J.J. RICHARDSON D.S.O proceeded on leave. Enemy endeavouring to repair wire entanglements. New wire observed at M.10.C.2.4. Much work going on in Enemy front line. 6 Position as yesterday. Our artillery fired continuously on enemy wire and trenches all day. Sniper Godfrey claimed on Hun. MAJOR L.E. JONES proceeded to England on senior officers’ course. 6 o.r. arrived as reinforcements. 1 o.r. killed in action. 7 Position as yesterday. Artillery did considerable damage to Enemy wire. Sniper Wood shot 1 hun. Enemy aircraft active, planes patrolling their own lines. 8 Position as shown. LIEUT. A.J.R. CRAIG arrived as reinforcement. 4 o.r.s returned from hospital. Nothing unusual. Patrols covered frontage and reported all quiet. 9 A coy relieved B coy in Right front line and C coy relieved D coy in left front line. Reliefs completed reported by code word “GALT”. During the day our Artillery fires 987 shells and 57 trench mortars in this sector. Enemy very busy draining and repairing his trenches. 1 o.r. reported “Died of Wounds”. 10 Position as reported yesterday. 2 o.r.s admitted to hospital. I o.r. Died of Sickness. Enemy fired 20 H.E.s to our rear in direction of Miria [?] (coal) #II at BETHUNE. Enemy anti aircraft active against our planes which patrolled our lines all morning. 11 Position as yesterday. During afternoon our Artillery bombarded all enemy lines between Fosse 16 and Double Crassier. Enemy replied but did no damage. 3 o.r. admitted to hospital. 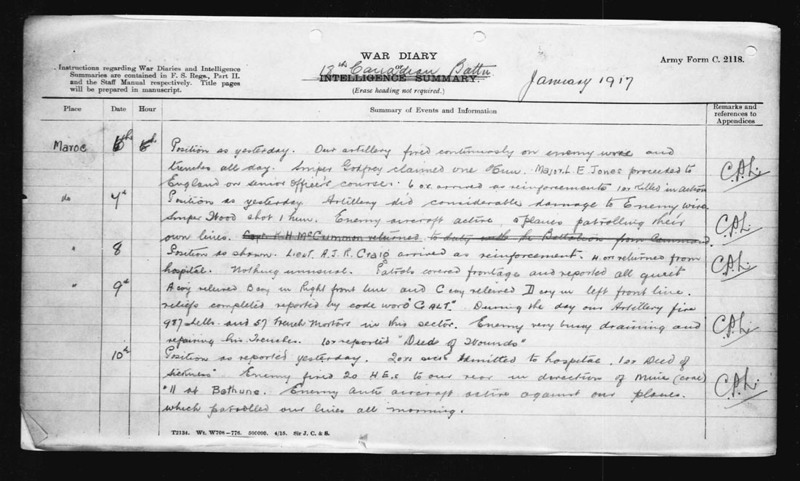 12 Raid was planned for operations this morning at 7.45 AM in conjunction with the 5th Canadian Infantry Brigade. The object of which was to cause casualties to the enemy, secure booty, and wreck all dugouts in the system of enemy trenches. This operation was postponed owing the fact that the enemy wire was not sufficiently broken up and their being to favourable wind for smoke barrage. 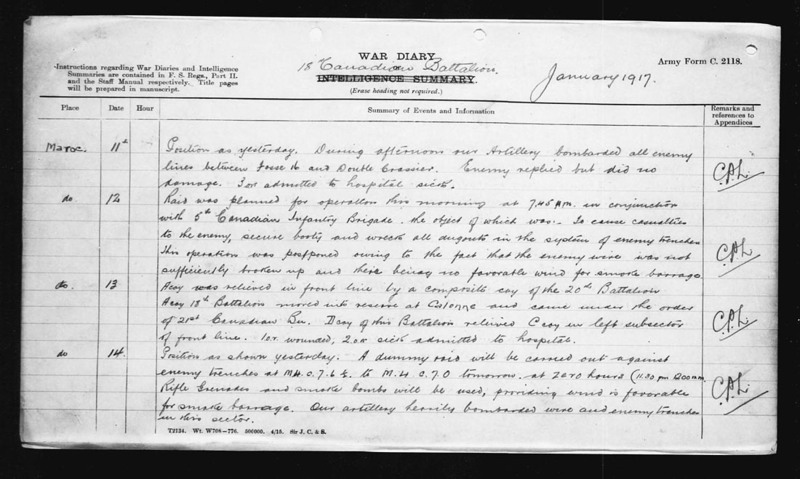 13 A coy relieved in front line by a composite coy of the 20th Battalion. A coy 18th Battalion moved into reserve at CALONNE and came under the order of the 21st Bn. D coy of this Battalion relieved C coy in left subsector of front line. 1 o.r. wounded, 2 o.r. sick admitted to hospital. 14 Position as shown yesterday. A dummy raid will be carried out against enemy trenches at M.4.c.7.6.1/2 to M.4.c.7.0 tomorrow at Zero Hours (11:30 pm 12:00 am). Rifle grenades and smoke bombs will be used, providing wind is favorable for smoke barrage. Our artillery heavily bombarded wire and enemy trenches in this sector. 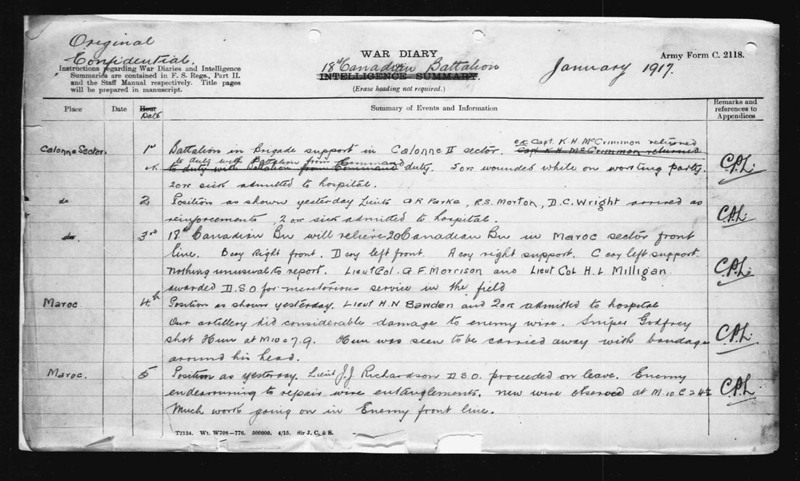 15 Operation as shown in yesterday’s diary is postponed on account of the 4th Canadian Inf. Bgde. postponing the whole operation. MAJOR J.A. MacINTOSH [McIntosh] appointed Adjutant from 1.12.16. Our artillery continuously bombarding Enemy wire and trenches. 2 o.r.s reported wounded 2 o.r.s sick admitted to hospital. 16 Position unchanged. Our ‘Stokes Mortar’ made several direct hits on Enemy wire and trenches doing considerable damage. Enemy replies with 20 H.E.S [high explosive shells] to our support and reserve lines. 2 o.r.s sick admitted to hospital. 17 C company relieved A company in front line. A company moved into former position occupied by C coy at CALONNE. D coy moved up from CALONNE (support) to MAROC. 17/18th 11.30 pm The 20th Canadian Bn. together with the 21st Battalion carried out an operation against enemy trenches. 18th Battalion held front line trenches while this raid was carried out. A [good] number of prisoners were taken and the third line of Enemy trenches entered. 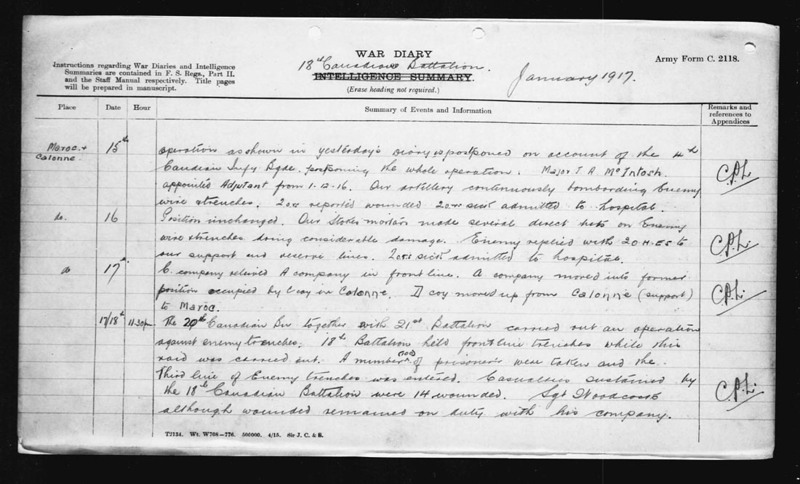 Casualties sustained by the 18th Battalion were 14 wounded. Sgt. Woodcock[ii] [?] although wounded remained on duty with his company. 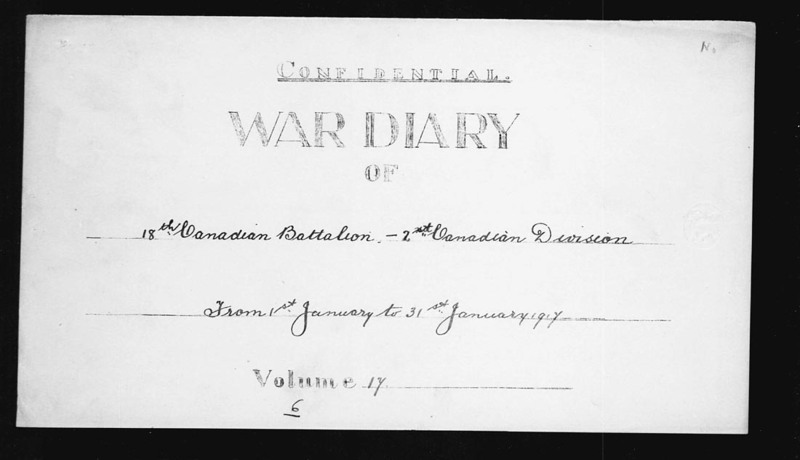 18 18th Canadian Battalion was relieved in the front line by the 14th Canadian Battalion. The 18th Battalion moved into Billets at BULLY GRENAY in Brigade reserve. 10 n.c.o.s [non-commissioned officers] o.r. arrived to be carried supernumerary to Establishment. LIEUT. J.J. RICHARDSON to be Actg. MAJOR while commanding a coy. 2 o.r.s returned from hospital. 19 18th Battalion marched to Canadian Training Area and billeted at HAILLICOURT being relieved in Brigade Reserve by the 16th Canadian Bn. 1 o.r. admitted to hospital. 20 Battalion clothing parade and Company inspections. 21 Church Parade and Commanding Officers inspection. 18th Battalion Draft coy joined the Battalion. 22 Physical drill, platoon drill, Bayonet, fighting and Section drill. 23 Battalion training. Platoon and Company drill. Bayonet fighting and Physical drill. 24 Company and Platoon drill. Recreational training. 1 o.r. returned from hospital. CAPT. J.P. CHRYSTAL returned from leave. 25 Physical drill. Section drill and Bayonet fighting. 3 o.r.s sick admitted to hospital. 26 Inspection of Companies by Company Commanders. Communication drill. 6 o.r. admitted to hospital. 27 Bridge Route March. 3 o.r. admitted to hospital. 28 8.30 am Battalion inspection and Church Parade. Afternoon Recreational Training. 2 o.r.s admitted to hospital. 2 o.r. returned from hospital. 29 Company and Platoon drill. Bayonet fighting and Physical exercises. 1 o.r. arrived a reinforcement. 1 o.r. admitted to hospital. 1 o.r. returned from hospital. 30 9.00 am Battalion paraded in full marching order and marched to Billets at AUCHEL via MARLES-Les-MINES and LOZINGHEM. 31 Battalion billets at AUCHEL. Company parades and Inspections. Physical exercises. Specialist training. 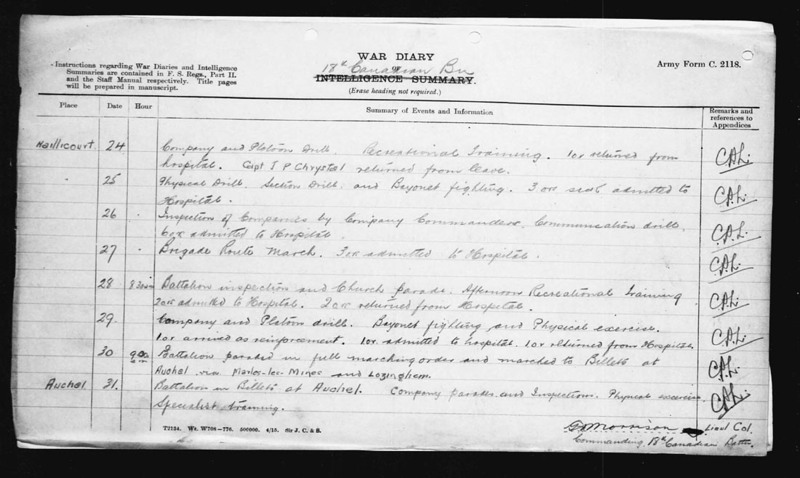 [i] May be referring to Lance-Corporal John Robin Godfrey, reg. no. 160504 but no confirmation at this time. [ii] Possibly Private Woodcock, James reg. no. 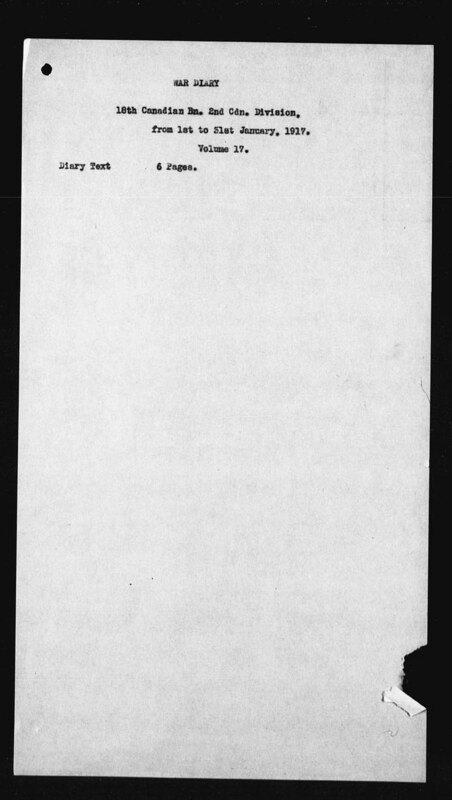 53755 on April 1915 18th Battalion nominal roll. Listed at L.A.C. as a lieutenant.